The first morning in Corkscrew Swamp went from a very slow walk, stalking a Snowy Egret, to complete and total chaos in a split second. In the tree tops right above us 2 very large birds were screaming and fighting. The trees blocked any photos but we could see them plowing between branches. One bird had chased another, then landed back near us. 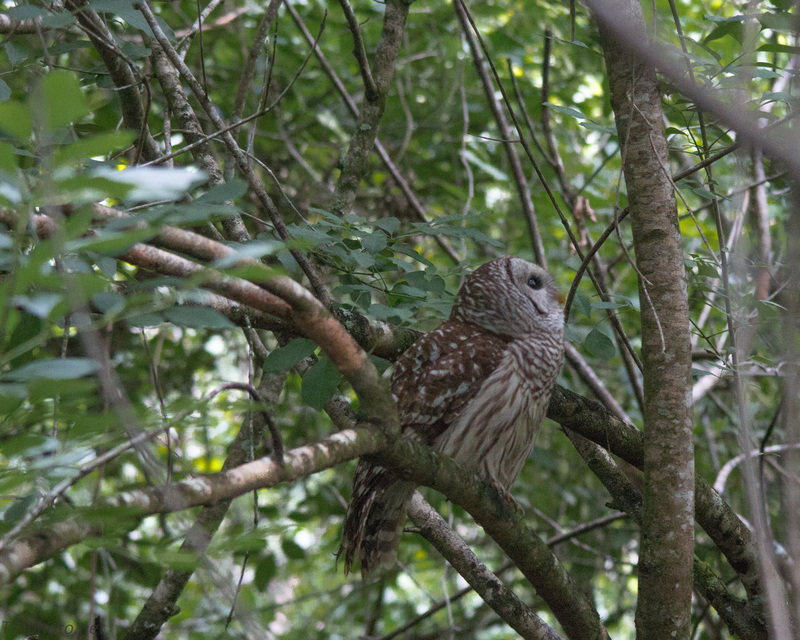 It turned out to be a Barred Owl. For quite some time the Hawk and the Owl went back and forth through the trees and over a small swamp area. 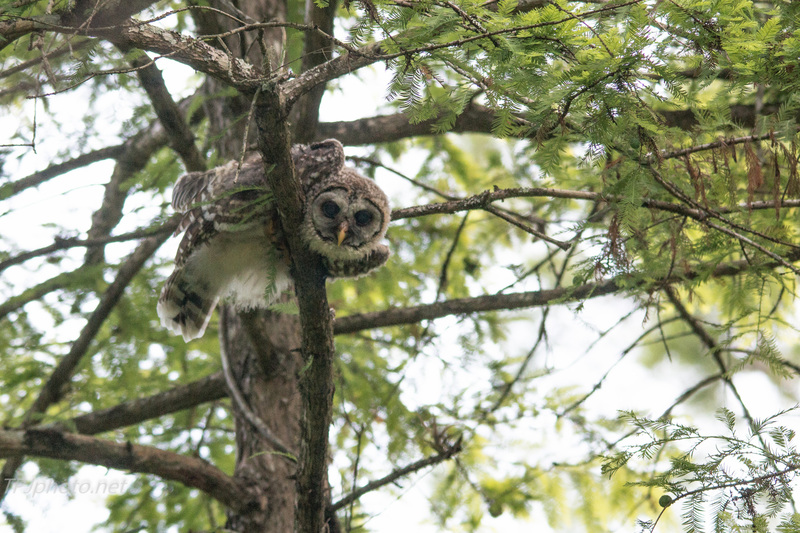 We found 2 Owlets hiding in the trees nearby. They looked a little big for the Hawk but obviously Mom was taking no chances. The Owls had no interest in us at all. Drawn by the noise other photographers came to the swamp edge. The Owl family of 4 ignored us and hunted along the waters edge. The Hawks and food were important, we were just one more ‘critter’ among all the other swamp residents. Click here for a quick review of our photo shoot week. Before this photo trip I had never seen an Anhinga except from afar. I assumed they were Cormorants. Seen close they are really beautiful birds. 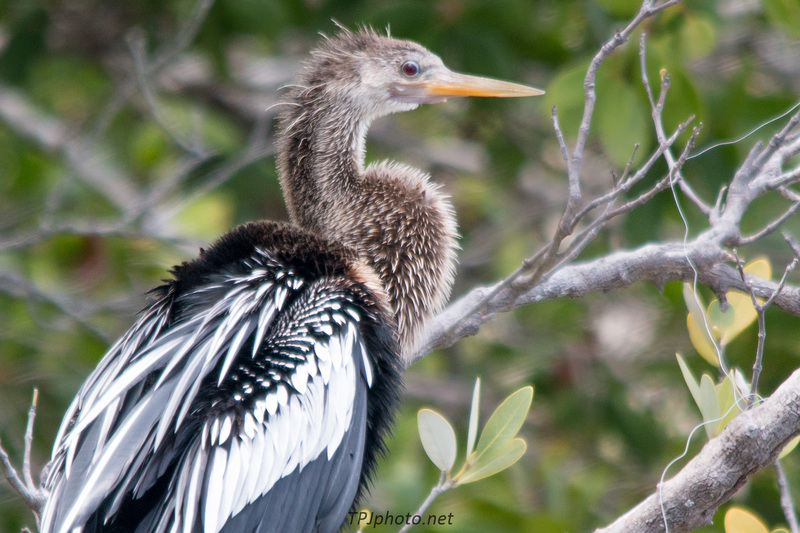 Anhinga’s are also called Snake birds, they swim with only their neck and head above water. Piano birds is another name based on their wing feather shape and colors. Like Cormorants they lack body oil for their feathers so they must spend time with wings held wide, drying off. They are much bigger than our local Cormorants. While we do have many photo pages shot from other parts of the world anyone who follows this site will expect mostly New England based articles. Our typical short themed articles are local to our area. After a long, and thankfully productive, winter we decided to take a photo trip south. We settled on Florida and the northern end of the region where the Everglades start. All the locations we visited were either found on-line or suggested to us by local Florida photographers who found us wandering around and took pity on us. With one exception we hiked on trails or state/public utility provided roads. We did find a great preserve that allowed us to drive along marshes and park anywhere. After a week on foot it was a welcome change. I will say at first it was a little unsettling parking the rental car on a roadside dirt patch and following a flat trail through dirt and saw grass. I much preferred the places that had Rangers, a trailhead info booth, etc., however ultimately they all provided amazing scenery, wildlife, and some ravenous blood sucking bugs. We didn’t know April was nearing the end of the dry season. This did affect our trail decision once we started. Some marshes were dry, just hard packed dirt and sharp saw grass, and the billions of hungry flies. Florida Panthers like this terrain but a search here produced bug bites, warning signs on what to do when facing panthers, and nothing more. Oh yeah, wild pigs are a problem too. Swamp land that did have water has shrunk to a small area. This actually helped us. The local wildlife population was in a more condensed area and easier to find. In some cases many had learned to live close to each other. Unfortunately for some the predators were also packed in close. Day 2 we found some large Alligators in a swamp. Towards the end of the week we came across a pickup truck being loaded with them. I quickly learned how to look at the mud trails and see if the Alligators were using them too. Even for me it’s hard to miss a dinosaur track. Over time this site and PassingByPhoto.com will share our photos and the related stories. As always thanks for visiting. OK, really bad joke but I could not resist. Owls are always associated with night. They hide during the day. Hunting and other activities are after dark. But not all Owls. 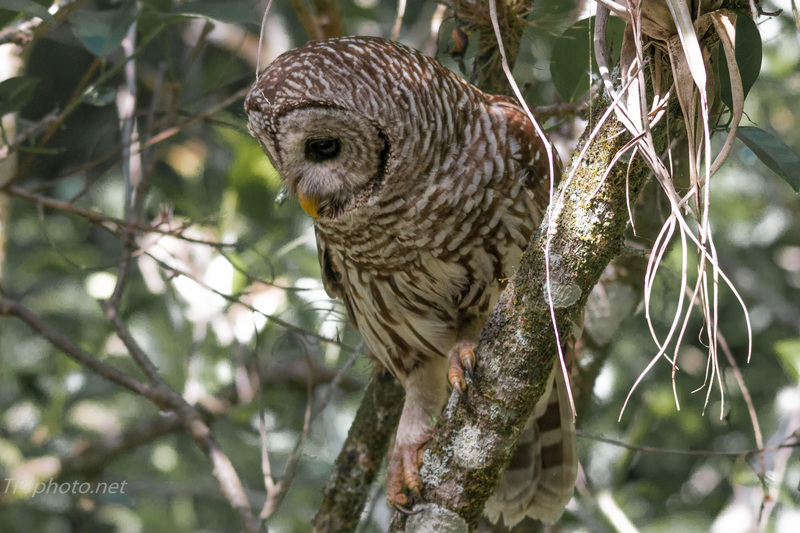 It seems in the Corkscrew swamp area, Florida near the start of the Everglades, the Barred Owls have evolved to be active during the day. There is more competition for food there at night and Hawks are an on going danger. The Owl here was out in full daylight. I watched her hunt, fight with Red Shoulder Hawks to protect her young, and really just hang out. The Corkscrew Swamp Sanctuary includes hiking trails and a boardwalk along a central lake. The preserve is 13,000 acres. During the dry season many of the residents are forced to congregate at one of the larger lakes. Great for photography, bad for the locals. 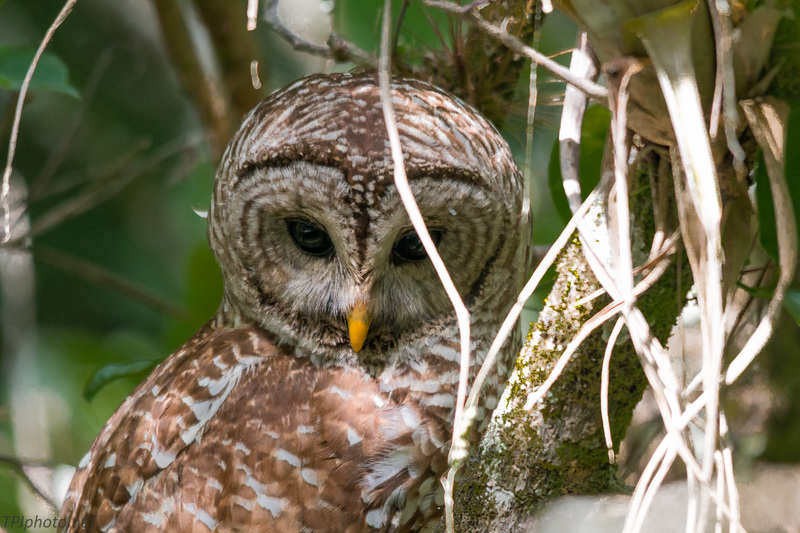 Alligators swim right beside wading birds, Hawks and Owls prey on each other. In general it’s chaos for about a month. 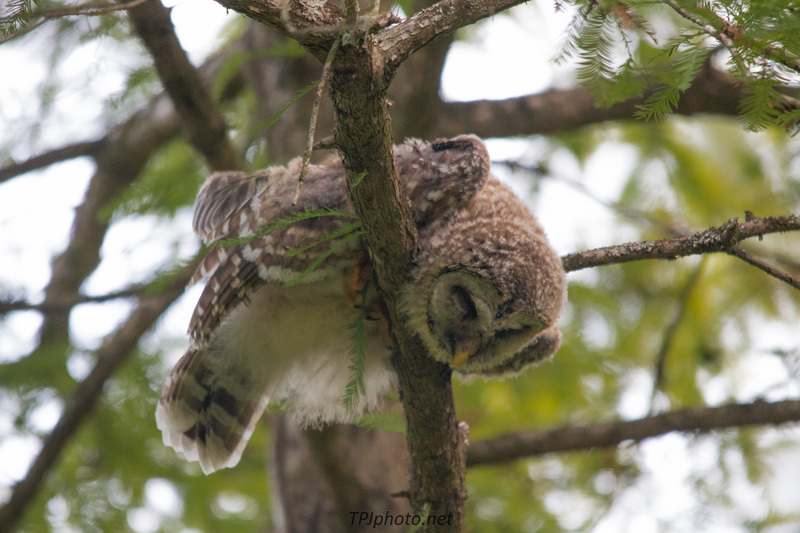 The shots taken here were while a pair of Red Shoulder Hawks flew over head looking for the young Owlets. Mom (above) ran them off. 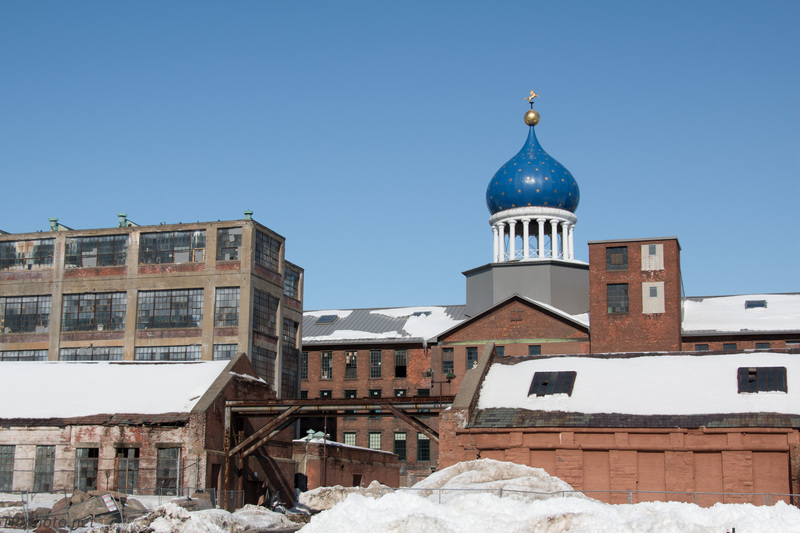 The Hartford skyline has a unique feature, the Colt Manufacturing Onion Dome. Yes, the ‘gun that won the west’. Samuel Colt manufactured the Colt 45 here, as well as many other pistols and rifles. The factory was active for over 100 years. At one point all the major U.S. firearms companies were within a 50 mile radius of Hartford. The dome unfortunately sits atop the closed, and rundown factory building. 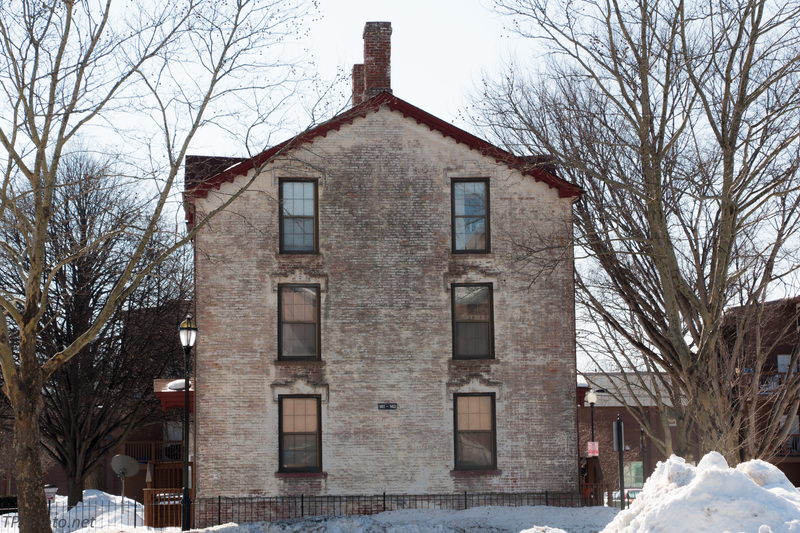 Just recently the area received the status of a National Historic Landmark and will be renovated soon. Until then it remains as the photo above. A rusty hulk and nothing like the huge facility it had been in the 1800’s. Just a note about the area. Coltsville was a small self reliant city inside the city of Hartford. Housing, schools, and stores were provided by Colt. Some housing is still in use. Colt was also responsible for building a large flood dyke to stop the Connecticut river from flooding the area. It is still used and has saved the Coltsville area of the city from many dangerous floods. I just don’t have enough stature around here to have the state capital building closed down for a photo shoot. I wanted to have minimal cars and people so a cold weekend day was my other option. This meant outdoor photos only, but I can come back. Even though I have lived here for quite a long time this was my first time actually having the Capital building as my destination, not something viewed as I pass by. In fairness I’m getting better. It took me 15 years, after I left NYC, to visit the Statue Of Liberty. To this day I have only been to the 12th floor of the Empire State Building. 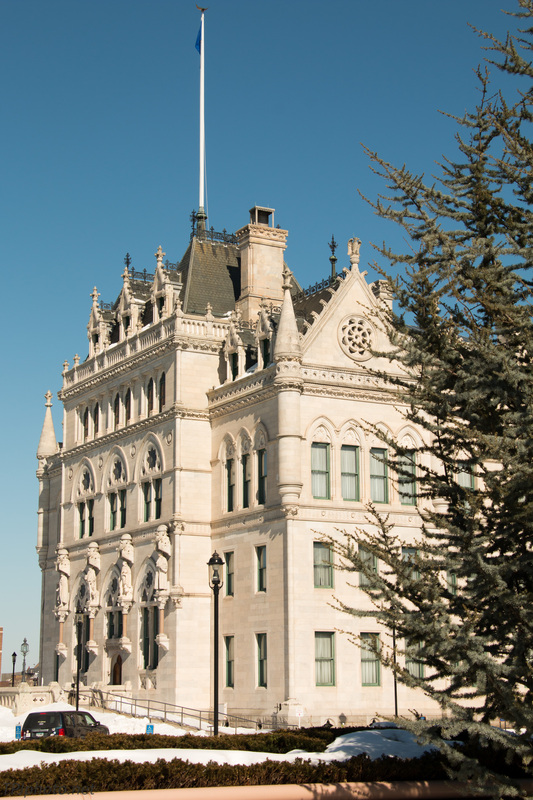 The building was completed in 1878, with the first state meetings in 1879. 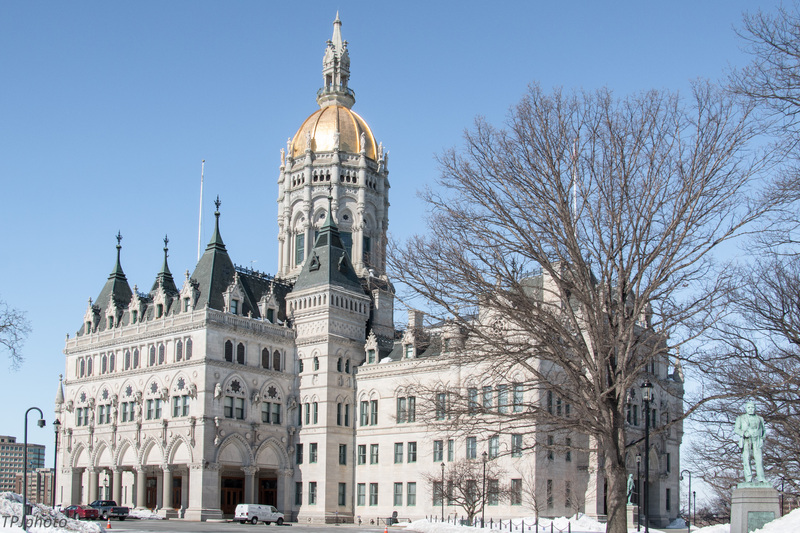 This is the third capital building Connecticut has had. Starting with the revolutionary war the cities of Hartford and New Haven were both used for state government (politics hasn’t changed much I guess). 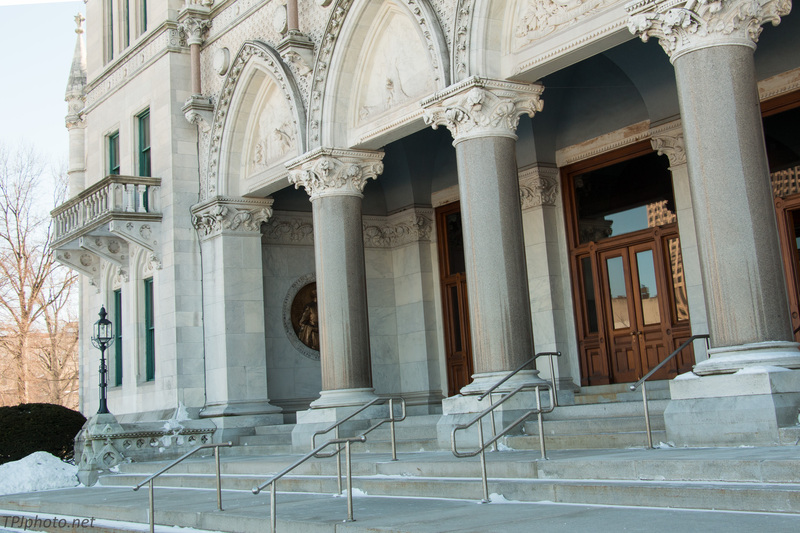 After the civil war state government moved to Hartford full time. Please view the buildings history here. Connecticut Capital Building. Main Entrance. The carvings and statues are not the centuries old Gothic ones seen in France or Germany. However, the quality, detail, and numerous types are pretty impressive. The cost of this building, right after the civil war, was enormous. No state government could ever consider anything like this today. Connecticut Capital Building. 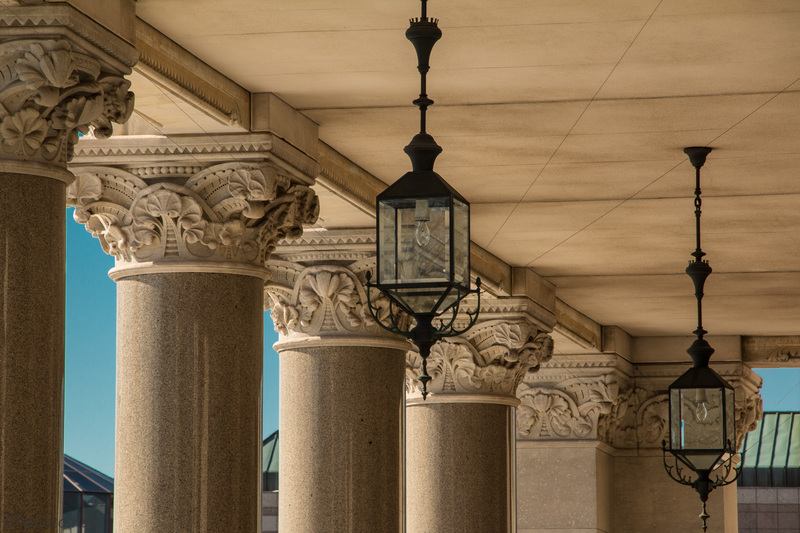 Side Entrance Columns and Lighting. Connecticut Capital Building. Back Entrance. The flowering trees and bushes here and across the street in Hartford’s Bushnell park will make this a spring and summer repeat trip. After viewing a great photo of a back door by Victor Rakmil Photography I remembered my own set of images. 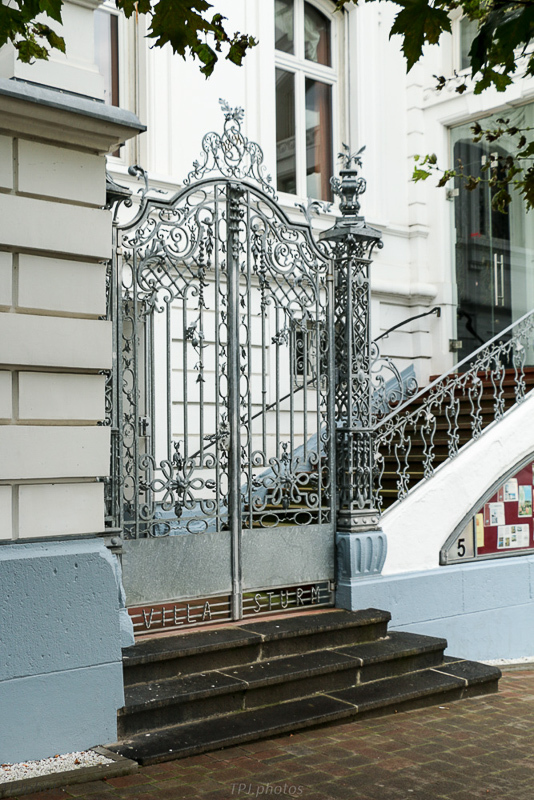 Several months ago I organized shots taken of doors from a few different cities. Each was completely different than anything I had ever seen before. Every one had a story to tell. A door here in Connecticut, USA, usually looks very much like all the other doors. Not so with these old, some ancient, doors. Please click any image below to view in a larger size with more detail. I did my best, in the limited space, to explain a little about each entrance way. None of these shots will win an award. That’s not what they were about. Photos like these are meant to share an experience with others. 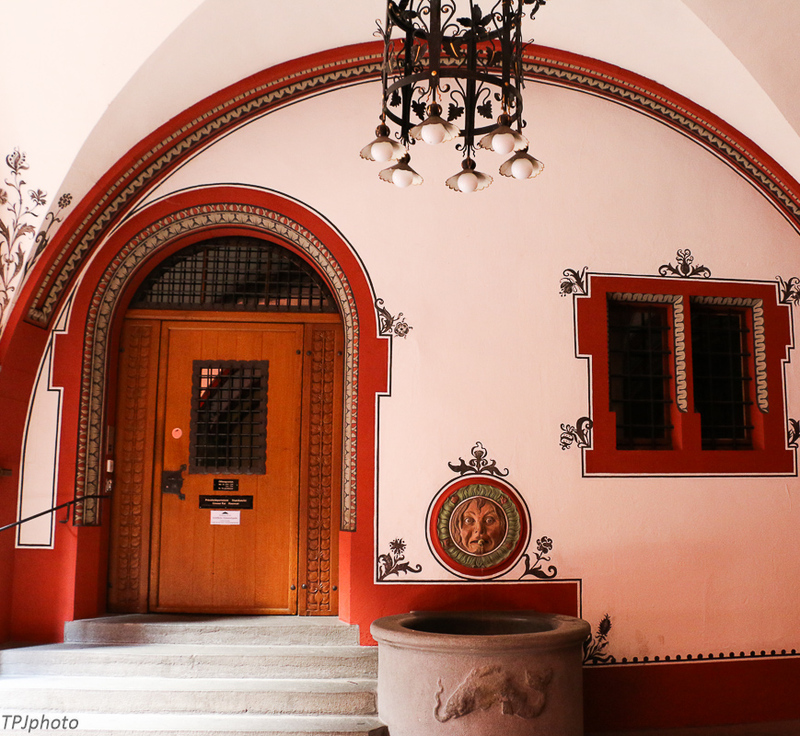 Door at a Franciscan residence office in Mannheim. No other markings except for a small sign by a garage entrance and the coat of arms. 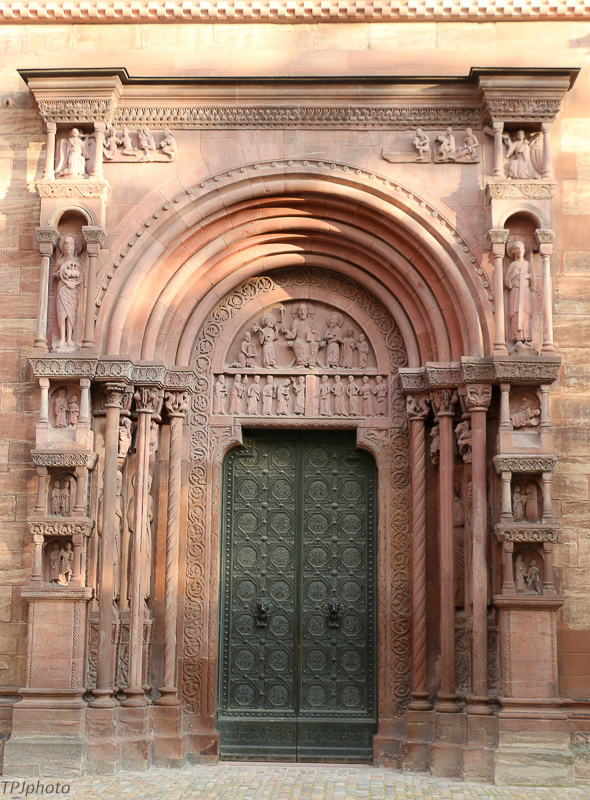 One (side) entrance to St.Catherine and St. Nicholas church in Basel Switzerland. 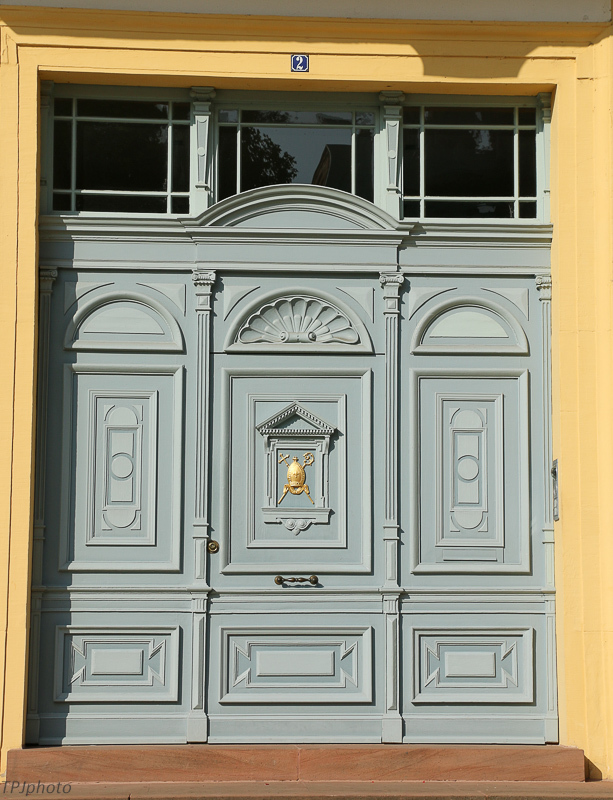 The door is made of bronze or iron. Probably 10 or 12 foot tall at least. The archway carved stoned. Basel Switzerland City Hall. 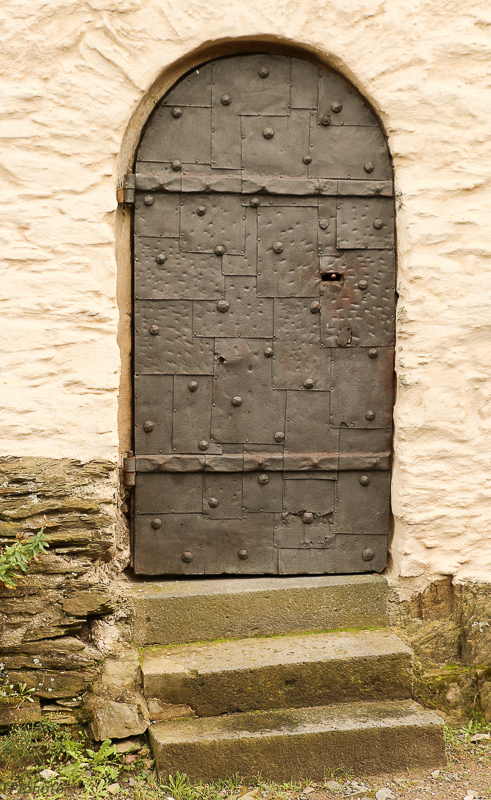 One of 2 main doors in the courtyard. This one has the wonderful fountain. Built in approx 1100, painted vibrant colors and designs. It is still the city hall. This may be one of the most interesting and beautiful buildings in the world. As good, if not better, than anything Paris or Rome has to offer. Boppard Germany, small hotel on side street near the Rhine river. I discovered this (Hotel Sturm) just walking along the city streets by the river. 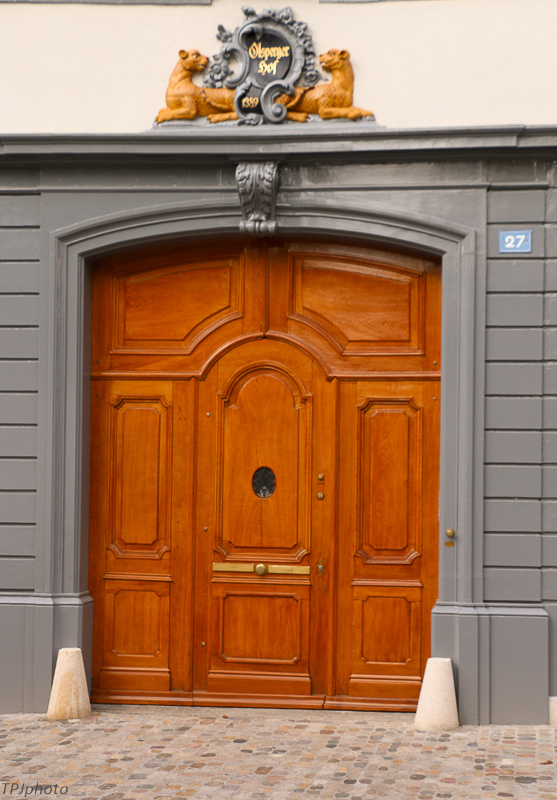 Side street door from Basel Switzerland. Huge wooden doors, and great carved arch. At the base of the steps you can see the down spouts. No idea what or who is behind it. 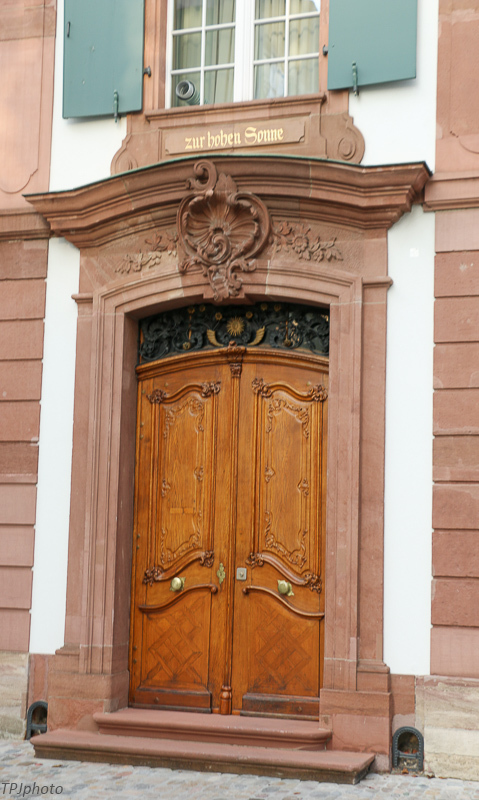 Side street door from Basel Switzerland. I believe this was on the street as the previous door. 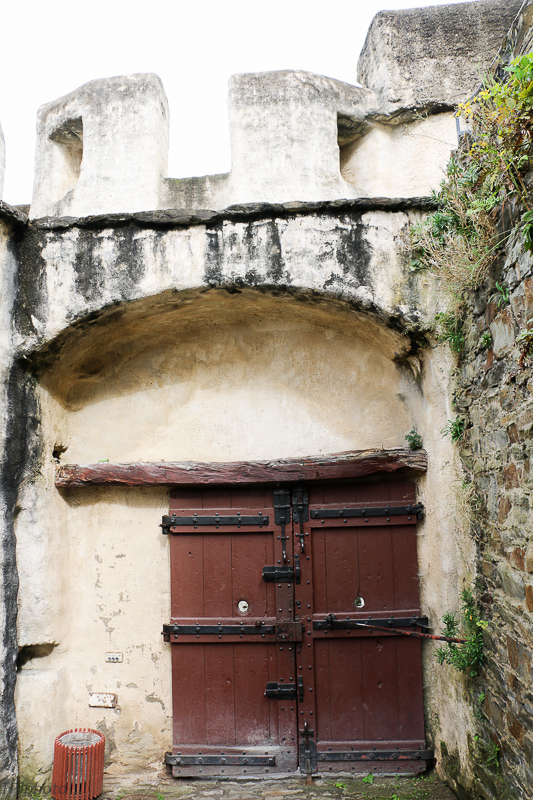 Locked door to the ramparts in a fortress. Koblenz Germany. A huge fortress guarded the Rhine and Moselle rivers from high above. 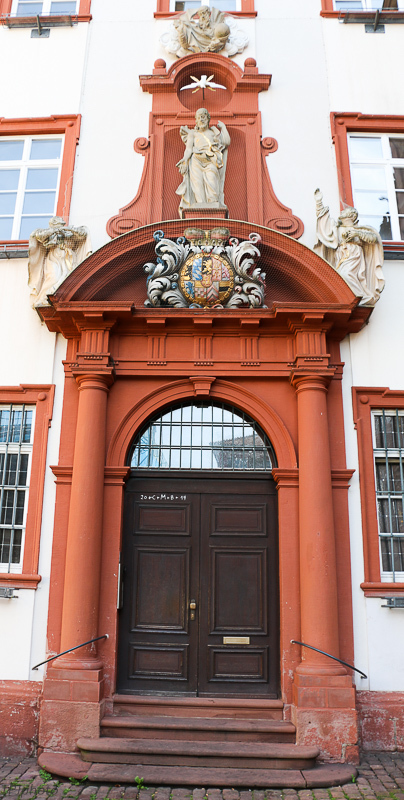 Courtyard door in the Koblenz Germany fortress. No detailed carvings or archway. Just solid wood and iron to keep you out. Or maybe ‘in’ depending on how you look at it. It got my attention.